Sandra Reeve is a movement artist, director, teacher, mentor, gardener and dance movement psychotherapist living in West Dorset, where her international ‘Move into Life’ programme of courses and events is based. 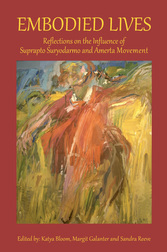 Sandra is particularly known for her work on the themes of movement dynamics, ecological lenses and ecological movement. She completed a PhD in Performance Practice at the University of Exeter in 2009 where she remains an Honorary Fellow. Her thesis was called ‘The Ecological Body’. As well as writing widely for Routledge, Intellect and others, she is co-editor of Triarchy's Embodied Lives, author of Nine Ways of Seeing a Body and editor of Body and Performance. See more about her research projects and recent performances. Sandra is also the Triarchy Press Consultant Editor for Movement and Somatic Practices.